Cos (Bill Cosby) would not be Cos, and Sidney (Poitier) would not be Sidney, if Sammy had not been Sammy,” Willie Brown, who then was Speaker of the California Assembly, once said, calling Davis Jr. the godfather of today’s black superstars. Davis actually was America’s first black superstar. He danced, sang, performed comedy and acted-and was stellar at them all. But having a variety of entertainment skills was not unusual among performers prevalent when Davis was a child: At that time vaudeville was still popular, and variety acts were the cornerstone of vaudeville. Davis was born in 1925 in Harlem to a Puerto Rican mother and African-American father, both vaudevillians. When Elvira and Sammy Davis separated in 1928, the senior Davis gained custody of his son and promptly took him on the road as part of the Mastin Troupe. Young Sammy quickly took to the performing life. He became a Mastin Troupe regular at age 5 in 1930– and at age 7 made his film debut in the musical short “Rufus Jones for President.” Davis Sr. and “uncle” Will Mastin carefully shielded the youngster from racial discrimination, explaining away slights and snubs and ensuring that Sammy’s early years, at least, were free from the limitations imposed by racial ignorance and hatred. Sammy’s life was free of other things as well: his busy vaudeville schedule made it impossible for him to attend school. He dodged truant officers and got by with a rudimentary reading level until his late teens. But his education in entertainment, constantly reinforced by Mastin and Davis Sr., was superior. They added to their young charge’s knowledge of dancing, singing and the art of engaging audiences with confident patter and a wide smile. But as the rise of motion pictures began stealing the light from vaudeville, more and more acts died out. Eventually, the Mastin Troupe was reduced to a trio consisting of Sammy, his father and Mastin. Gradually the younger Davis became the trio’s star, leading the act to larger and larger clubs. Along the way, Sammy met and became friends with such key entertainers as Bill “Bojangles” Robinson, who tutored him further in dance. And big band leader Tommy Dorsey introduced Sammy to Frank Sinatra, who would become a lifelong colleague and friend. The Mastin Trio’s momentum was interrupted when Davis turned 18 and was drafted into the United States Army. He was sent to basic training in Cheyenne, Wyoming, where for the first time, Davis encountered the rampant discrimination from which his father and longtime friend had shielded him. Tempering the constant humiliation was his friendship with a black sergeant, who taught Davis to read and lent him books to distract him from his anger. Eventually, Davis was transferred to an entertainment regiment and was soon performing to the cheers of those who previously would have mistreated him. It was a revelation. Davis’s return from duty reignited the Will Mastin Trio. Sammy, his father and Will went back out on the circuit, eventually opening for Mickey Rooney, who was so taken with Davis’s impromptu impersonations that he urged Davis to include them in the trio’s act. By the early 1950s, the trio was headlining major venues from New York to Los Angeles. 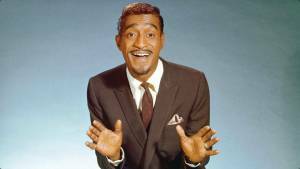 In 1954, Davis cut his debut album, “Starring Sammy Davis Jr.,” on the Decca label. It immediately soared on the charts. Another LP, “Just for Lovers,” was also well received. Both efforts helped propel Davis to prominent appearances in Las Vegas and on television. Davis may have gone solo, but he didn’t leave his father and Mastin out of the profits: He simply continued to split his earnings three ways. But his earning potential was jeopardized when Davis, driving in the California desert after a Las Vegas engagement, was involved in a serious car accident. The impact fractured the bones of his face and cost him his left eye. While he convalesced, Davis had time to reflect and to engage in long conversations with a rabbi at the hospital. Davis later said that he found many parallels between the challenges Jews and black Americans faced, both historically and contemporarily. This deep reflection led Davis to convert to Judaism, a calling he embraced throughout his life–and characteristically worked in as fodder for his act, joking that he was entertainment’s only one-eyed Jewish black man. Membership in the Rat Pack was profitable for Davis–it brought him a regular income, a starring role in “Oceans 11,” and a constantly high profile. The group, which included Sinatra, Davis, Dean Martin, Joey Bishop and Peter Lawford, performed at The Sands in Las Vegas and its members generated gossip-column headlines–deserved as well as not–wherever they went. The rigors of performing, the excesses of the Rat Pack lifestyle and the strain from the rumor mill doomed Davis’s marriage; he and White divorced in 1959. Davis’s next marriage, in 1961 to Swedish actress May Britt, generated another kind of press: the public outrage over the mixed union was so vitriolic that the two were forced to hire bodyguards. Britt and Davis had two children and adopted another–but she and the children couldn’t appear in public with their husband and father, for fear of violence and professional backlash. Throughout the 1960s, Davis campaigned against segregation, marching with Martin Luther King, Jr., and refusing to work at whites-only venues. Over time, his determination and clout led clubs and casinos across the country to integrate. He wrote about his determination in 1965 with the publication of “Yes I Can: The story of Sammy Davis, Jr.,” which he authored with Burt and Jane Broyar. For his efforts against racism, Davis eventually won the Springarn Medal from National Association for the Advancement of Colored People (NAACP). Through this time, Davis’s performance schedule never waned. Between 1961 and 1968, he starred in another Rat Pack movie, “Sergeants 3,” performed in two other movies, produced 16 albums that generated at least eight hit singles, and starred in (and won Emmy nominations for) two television variety shows. He also continued appearing on stage, in the musical comedy “Mr. Wonderful,” and in a Tony-nominated role in “Golden Boy.” Davis was a megastar, and he reveled in the adulation he strove so hard to win. The breakneck pace and increasingly high-life habits were too much for his marriage to bear, though, and Davis and Britt divorced in 1968. In 1970, Davis married Altovise Gore, a dancer he met in London. The marriage endured, and the two later adopted a son. But despite his personal happiness, Davis was to endure professional turmoil as political and career choices tarnished his reputation. The ardent left-winger of the 1960s threw his arms around Richard Nixon in the early 1970s. His performances for troops in Vietnam didn’t help matters, and Davis endured the critical reversals that often follow meteoric rise. Davis’s health also suffered. During the mid-1970s, he was plagued with drug and alcohol addiction, and resulting liver and kidney trouble sent him to the hospital for several months. Davis suffered a heart attack in 1974, but recovered and continued his tireless work pace. He cut at least five LPs, starred from 1975 to 1977 in the television variety show “Sammy and Company,” performed in the Broadway musical “Stop the World–I Want to Get Off,” and continued appearing in casinos and nightclubs. The 1980s were also busy years for Davis. He continued appearing on television and stage, and performed in the “Cannonball Run” movies. In 1988 and 1989, despite having undergone hip surgery, Davis gave his last set of stage performances, appearing with Sinatra and another longtime friend, Liza Minnelli, in “The Ultimate Event.” His last film, “Tap,” a tribute to the legends of tap dancing, screened in 1989. In August of that year, doctors found a tumor in Davis’s throat. It turned out to be cancerous, and Davis was treated with eight weeks of radiation therapy that initially seemed to help. But in 1990, examination of what they thought to be a gum infection revealed an even bigger oral tumor, which turned out to be inoperable. In April of that year, Davis’s lifelong performing friends paid tribute to him with a television special in his honor. A few weeks later, on May 16, 1990, Davis died in his home at age 64. In memoriam, the lights on the Las Vegas Strip were darkened for 10 minutes, an event that had happened previously only for the deaths of President John F. Kennedy and of Martin Luther King, Jr.
As they had celebrated him, so did Americans of all races and religions mourn Davis’s passing. Performers eulogized him and publications, some of which had at times scorned Davis’s obvious drive for admiration, published glowing obituaries. Ebony magazine would write in tribute to Davis that through living his life, the entertainer “wrote the Fourteenth Amendment of Show Business.” Among Davis’s legacies, Ebony went on, was the establishing of a beachhead for racial and religious tolerance in the entertainment industry.